Apologies for the silence over the last few days; I think I exhausted all the latest political trends last week and was left with nothing to say until some real news stirred the F1 pot. And that amounts to the unveiling of Ferrari's latest offering, designated the F60 just to confuse us. Keith Collantine has a list of Ferrari's previous F1 naming systems if you wish to attempt to understand them. Photographs of the launch of the car can be seen at the F60 website and Autosport has an interesting article on the technical aspects of the new design. Apparently, the car will change considerably in the run up to the start of the 2009 season so we cannot take its appearance as fixed, but it does give us another angle on the much-discussed look of the new cars. We are told that the Ferrari is the first of the new designs to be shown, that the BMW tested to date has been only an interim car. It seems to me that, considering the F60 will change considerably before its first race and that the Beemer already has the major visual indicators (front and rear wings, no winglets, altered sidepods, slick tires) of the 2009 regulations, it hardly matters whether we consider a car a new design or merely a step on the way. F1 cars are honed and adjusted throughout each season and so there is no such thing as a finished product - what we are seeing is the general look of the cars for the coming season. Consensus seems to be that the Ferrari is beautiful and the BMW ugly. Whilst agreeing that the F60 looks great (apart from the odd little rear wing - that will take a bit of getting used to), perhaps even better than the F2008, I do think the BMW suffered from being the first to demonstrate the changes that all will have to accept. Whenever regulations influence the look of the cars, the enthusiasts react with horror so it is no surprise that our initial impressions were negative. Even were the BMW F1.09 to look very much the same as the interim car, it will not be any uglier than other cars on the grid in Melbourne, I think. We are just getting used to the new look. It is the technical aspect that should concern us more, anyway. F1 cars are never designed to look good - what matters is how well they perform. Autosport makes the point that Ferrari "exploits every blind spot in the bodywork rules to recoup the 50% loss in downforce" and it does seem that the designers have kept as many add-ons from the past as possible. The F60 is not yet the clean and uncluttered shape that the regulations intended, devoid of aerodynamic protrusions. This will be the approach of many, I am sure, and there will be a lot of copying of Ferrari's barge boards and fancy mirror supports in the offerings from other teams. I am not sure that this is an indication of great design, however. Surely it indicates a lack of innovation and invention, that a designer cannot accept that the answers of the past are no longer applicable and new ground needs to be broken. It seems to me that a Colin Chapman or a Gordon Murray would have looked for completely new ways to claw back downforce or perhaps even to have found ways to make the car function better with less downforce but more mechanical grip. There are fewer completely new approaches to designing a race car these days, partly because the regulations change so often that there is little time for a designer to conceive and develop fresh ideas. The record of the FIA over recent years also suggests that any really startling innovations would be promptly banned by an administration that wants a standard spec for the sport. Whether such standardization is really necessary is a debatable point but the plain fact is that a spec series would regulate the engineers and designers out of the sport and it would no longer be F1 therefore. But I digress. To return to the subject of the F60 launch, I admit that the car is both pretty and technically interesting. But Ferraris are always so, perhaps because they have the unfair advantage of being that gorgeous deep red color. It is on the track that we shall see the proof of the pudding, however, and I suspect that there is one alteration to the rules that might prove Ferrari's undoing, and I don't mean KERS (which I think will make no difference whatsoever). In the past two seasons we have witnessed a gradual decay in Ferrari's legendary reliability, the team suffering several engine failures, most notably Massa's in Hungary. With the engines now having to last twice as long in 2009, further problems could very easily erupt in this area. Even though the maximum rev limit has been decreased to 18,000 rpm, the need to stay ahead in the power output stakes will still put pressure on the engineers and I think we will see more engine-related retirements this year. And the form book says that most of them will be Ferrari's. "Keith Collantine has a list of Ferrari's previous F1 naming systems if you wish to attempt to understand it." ...and then you can explain it to me! I agree - it's pretty confusing. Lustigson is correct in that early systems were based on the capacity of one cylinder and the number of cylinders of the engine (note Enzo's conviction that the engine was all-important), but then it became almost arbitrary with all sorts of different naming systems getting a look-in. Personally, I like a simple system that states the name of the sport, F1, plus the year. Who cares what capacity one of the cylinders has, after all? Ferrari probably will suffer from reliability issues. Isn't it true that the reliability and/or performance of every team ebbs and flows with the coming and going of seasons? Some teams seem to swing back and forth at a much higher rate, usually lower grid teams... while those at the other end of the spectrum tend to suffer or celebrate several good or bad seasons in a row. The cause can be reliability or it can be lack of advancement... the latter is what worries me. Each time F1 freezes a technology, someone's crazy idea or concept is scrapped. The freezing of engine development means we won't see advances like turbos or the like. The freezing of transmissions means we won't see advances like seamless shift transmissions. Freezing any item that doesn't "contribute to the show" robs the engineers of their avenues of exploration, and robs us of the engineering spectacle that sustains F1 over the long term. In an attempt to spice up the racing (a short term goal) the FIA has sacrificed engineering (the extended show). I realize they are also trying to save money, but will we consider people like Ross Braun or Adrian Newey noteworthy if this trend continues? They are part of the show too. You're right that the top teams have a longer advance and retreat curve, Marc. this means that we tend to accept the status quo as being the norm and are always surprised when one of the greats descends into mediocrity. I watched it happen with Tyrrell, Brabham and Lotus and there is no reason it should not happen to Ferrari and McLaren too. Although it is sad to see historic names disappear from the sport, it is a natural fact of F1 life and prevents it becoming so predictable that we lose interest. As you say, that is one reason why F1 should remain the technical battlefield it has always been - spec series are typically dominated by one or two teams that have the money to get that little bit more out of a standard car. F1 does at least have the possibility of a brilliant engineer having a revolutionary idea that puts his team ahead of the rest and this can happen within even a small team. It is worrying that the increasingly restrictive regulations seem to have squeezed most of the innovation out of the sport already. i can't believe after all these years of rule making there are still designer blind spots,they always find a way to worm a little wing or spoiler somewhere...also the marlboro bar code,disgusting!! 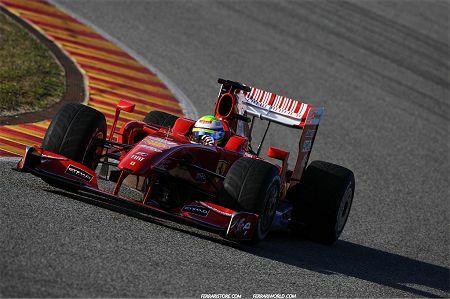 I have to say that I barely noticed the rear wing on the Ferrari because the front wing is so ridiculously awful. The rest of the car looks better than expected but it is only a launch car as has been said so we can't read a lot into it. I want to see what Adrian Newey will do with the regs. i like that his car will not launch until the last minute which should prevent any obvious innovations being copied before the first couple of races. Clive mentions that the Ferrari shows a lack of innovation. That is not unusual. In fact lack of innovation is a Ferrari trait that goes back to the founder of the company. I always find it funny when Ferrari fans complain about rules limiting innovation. Can anyone name a Ferrari innovation? Ever? Chapman was innvolved in F1 for 24 years which equates to 40% of Ferrari's time yet he introduced more innovation in any 5 or 6 year period than Ferrari has in its entire history. Chapman introduced monocoques, engines as stressed chassis members, ground effect aero etc. Gordon murray was similarly inventive introducing everything from the fan car to surface cooling to the laydown Brabham BT55 / McLaren MP4/4. The only significant innovation I can think of at Ferrari was the semi-auto gearbox but John Barnard had already designed that before he went to Maranello. Rob: I'll give you this much - the Beemer is not as pretty as last year's and the Ferrari (to my eye) looks better than the F2008. But that is not to say that the BMW is ugly; the front and rear wings are almost identical to the Ferrari's so that is not the difference. It's the bodywork and dimensions - the Ferrari looks better balanced than the slightly ungainly Beemer. And that could change before Melbourne. One thing I have noticed is that old fogies like me tend to like cars that are less fussy in detail and have better proportions than do the young, who seem to accept all the odd growths that have sprouted from F1 cars lately. So, as far as I'm concerned, one of the best looking production cars of recent years was the Audi S3 with its pure and simple lines, perfect balance and proportions. And I have always detested Toro Rosso's clownlike livery, whereas the young seem to think it makes the car look great. It isn't just their engine reliability, there's been a general decline in Ferrari's performance over the last couple of years. Strategy is another area that's got worse, as we saw at races such as Monaco last year. Steven: Funnily enough, I thought of Adrian Newey when I was writing this post. If anyone is going to make a breakthrough in design, it would be him. He is the last of the complete designers, after all, the guy who can design the whole car and not just one aspect of it. And that gives him a good deal more scope for trying something new. Seriously though, you're absolutely right - Ferrari as a team has degenerated from its previous machinelike efficiency over the past two years. And the reason is fairly obviously the departure of Ross Brawn, Jean Todt and Michael Schumacher. I predicted as much when the dream team split up, although it is a slower decay than I expected. To be fair Ferrari's decline start in 2005. I dunno, I would call 2005 more of a hiccup than the beginning of a decline, Filipe. They were very competitive in 2006 after all. Ferrari may not even be in decay as much as stagnation, which in motor racing is the same as decay... nevermind. hm... thoughts on the RAI vs MAS balance. balance than understeer. Massa quite the opposite. That's why the shark (fin) bit Kimi. Hi everyone. I never know how much of what I say is true. I am from Republic and too poorly know English, tell me right I wrote the following sentence: "Left, bullet seo optimization, right.Sarah king gives her own perspective on the world of webmastering and search engine optimization, with a kiwi flavour." :-D Thanks in advance. Kanika.